Off Late, Bing has been working on bringing more information to its website to help users to save lot of time. 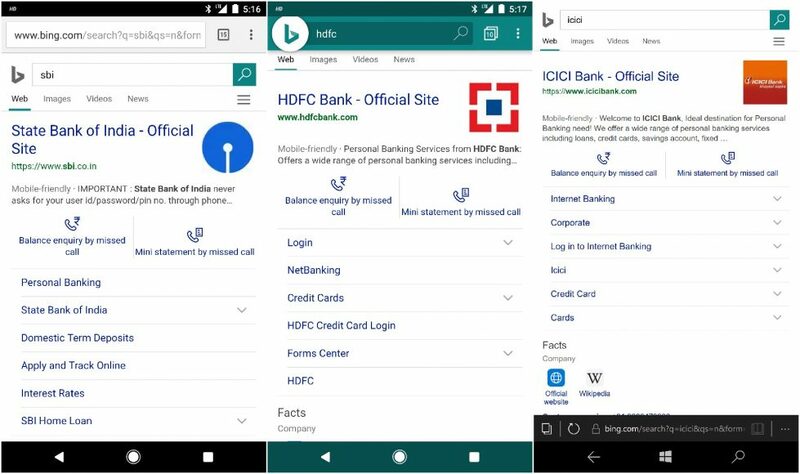 Now Bing has introduced a quick way for users to connect with their bank to get account information and mini statement from within the search results. Now when you try to search for any major bank in India on Bing, you will now be shown an option to give a missed call to the bank for account balance and also enquire about the mini statement. You will be able to dial the bank’s mobile banking number and you will be able to get the account information as an SMS to your Registered Mobile Number. You will be able to get the account details if you are a registered mobile banking customer with your bank and the number you are dialling from is updated in their records. This integration of Bing is live in India and is available on all mobile browsers across the platforms.